Morgan Stanley has spent the better part of a decade fortifying its operations against stormy markets. In the third quarter, it didn’t work. The summer’s unusually severe volatility sent its profit down 40% thanks to weakness in trading and a hit to private-equity investments in Asia, interrupting a push by Morgan Stanley Chief ExecutiveJames Gorman to diversify the investment bank and make it less prone to trading blowups. After narrowly surviving the financial crisis, Morgan Stanley bought a big wealth-management business to stabilize its revenue. Mr. Gorman then slimmed down the most volatile unit, the one that trades bonds, currencies and commodities. But the latest quarter delivered a jarring reminder that even in its more balanced incarnation, Morgan Stanley remains beholden to Wall Street’s ups and downs. Morgan Stanley’s third-quarter profit fell to $1.02 billion, or 48 cents a share, from $1.69 billion, or 83 cents a share, a year earlier. Revenue fell 13%, to $7.77 billion. Analysts polled by Thomson Reuters had expected earnings of 62 cents a share. Revenue also fell greater than expected. The firm’s stock slid $1.63, or 4.8%, to $32.32, in 4 p.m. trading. The results were the worst among Wall Street’s big banks and revived concerns about the future of a fixed-income, currencies and commodities trading business—commonly referred to as FICC—that fared more poorly than peers. Goldman Sachs Group Inc. and J.P. Morgan Chase & Co. also reported lower fixed-income trading revenue last week. Morgan Stanley’s executives had shrunk its fixed-income trading business as new bank-capital regulations crimped some of the unit’s profits. But senior Morgan Stanley executives turned more optimistic earlier this year after some European rivals signaled they had withdrawn from trading operations, leaving more business for U.S. firms. The bank’s fixed-income business ended the first half of 2015 with its best start in four years. “So the bigger picture question is, what does Morgan Stanley want to be in FICC?” asked CLSA analyst Mike Mayo on the conference call. Mr. Gorman replied the strategy hasn’t changed. Some prefer a smaller bond-trading presence. Morgan Stanley had won over shareholders in recent years as Mr. Gorman’s strategy emphasizing steadier growth businesses like wealth management over riskier trading activities began to bear fruit. The firm made good on its goals to boost profit margins in the wealth unit, rebuild a stock-trading business damaged by the financial crisis, and return capital to shareholders through stock buybacks and dividend increases. Investors hailed the firm’s game plan as the right one for a postcrisis era on Wall Street. 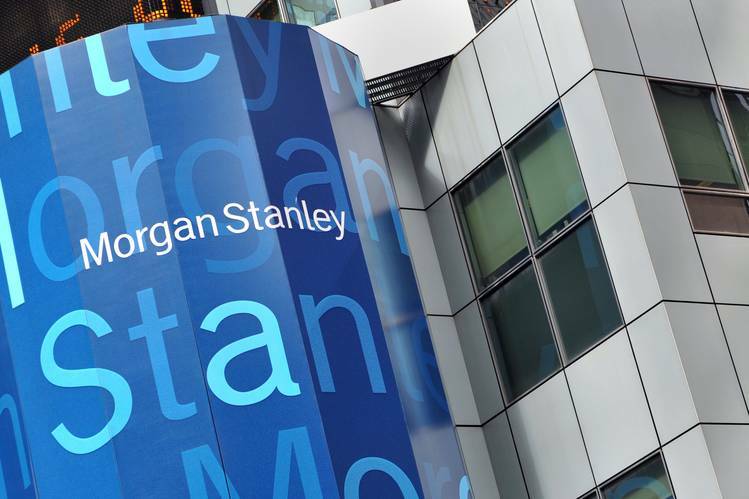 Monday’s results may not have sapped shareholders’ confidence, but they did show how Morgan Stanley still has a way to go toward insulating its results from the markets’ inevitable swings. In an interview Monday, Jonathan Pruzan, the firm’s finance chief, said, “we still believe we can generate a sustainable 10% return on equity with our business model.” Excluding an accounting adjustment, Morgan Stanley’s return on equity, a commonly used measure of bank profitability, fell to 3.9% in the quarter from 8.9% a year earlier. On Oct. 1, a day after the third quarter ended, Morgan Stanley elevated two longtime executives to new roles to run businesses that included FICC and investment management, two of the hardest-hit units in the third quarter. Morgan Stanley put its equities boss, Edward Pick, in charge of the fixed-income business as well and expects the two divisions will function more efficiently together, especially as the debt markets mirror equities’ move toward electronic trading. Revenue from equities was flat at $1.77 billion in the third quarter. But even that unit, long a strong performer at Morgan Stanley and Wall Street’s biggest by revenue, underperformed the four other large U.S. banks, which reported equity trading gains of 9% to 31%. Mr. Gorman also noted another recent promotion on the call: the appointment of veteran investment banker Dan Simkowitz as head of investment management. That business posted a $38 million pretax loss last quarter amid paper losses from Asia private-equity funds. The setback underscored how turbulence in a small number of funds could overwhelm the whole unit’s results. The firm has a relatively small footprint in traditional money management and has asked Mr. Simkowitz to try to expand the business, possibly through acquisitions. Revenue from bonds, currencies and commodities fell 42%, to $583 million, its lowest level since late 2011. Messrs. Gorman and Pruzan pointed out that Morgan Stanley’s credit and securitized-products divisions were especially weak, and the bank lacked the heft in currency trading, in which market conditions were better, to offset the shortfall. The performance prompted CLSA’s Mr. Mayo to ask Mr. Gorman how investors should think about the bank’s efforts to improve consistency.